Children can cool off and play in a public fountain, climb the courtyard tree, or smell the sweet fragrance of a Florida orange. 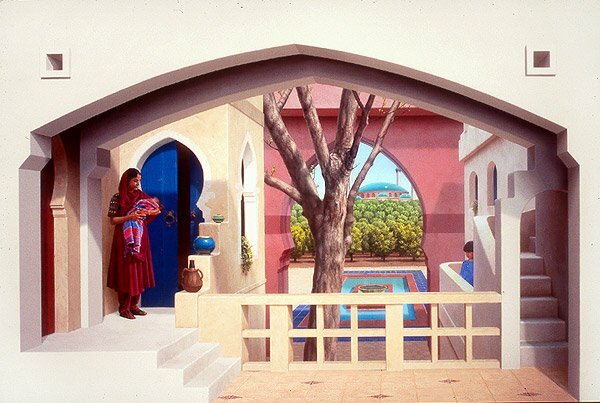 Using the illusionary painting style, arched entrances open into a world of Moorish architecture with a Southern Florida slant. The colorful approach to this mural project is not unlike the rest of the building’s Moroccan theme – not to mention the Opa-Locka region. Visitors to the Children & Families agency waiting for their appointment can book passage to a village square in a distant place. As the viewer wanders onto the balcony to peer over to a vista they are invited to explore the subtle ornamentation and nuances of the Moorish style and enjoy views of the palace. As the visitor continues to meander through the piece, they will also visually stumble upon what appears to be just someone else hanging around on the balcony – only to realize later that these convincing Moroccan family figures are painted illusions. Looking closer, visitors will find other more hidden elements such as the family’s father in the distant orange grove or the little mouse in the rain spout in Gates of Opa-Locka II.